The Apple Company introduces the new operating system that they will begin to use the Mac this year: the Yosemite. The version will replace the current operating system OS X Maverick. The OS will come with some important changes, especially, in the form of icon images. When you marvel at this amazing update, you may also find the tweaks finally make your desktop software fall into disuse. An instance in point is the Mac DVD ripping software. You will get nothing but disappointment if you try to rip DVD on Yosemite. To solve the problem, here we introduce you the best DVD Ripper for Mac that it is fully compatible with the new OS X 10.10 system. If you are looking for the most appropriate DVD Ripper for Yosemite then EaseFab DVD Ripper for Mac is a good choice. 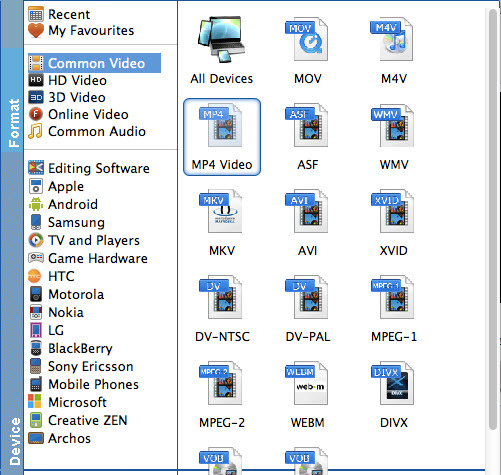 It lets you rip and convert DVD movies to virtually any popular video formats like MOV, MP4, M4V and more. Compared to other Mac Yosemite DVD ripping tools, EaseFab DVD Ripper for Mac supports more output choices. Apart from that, it also provides optimized presets for various mobile devices like iPhone, iPad, iPod, Kindle Fire, Android smart phones, PSP, Xbox and more. The conversion speed for the Mac program is high same as quality of the converted files. Just get it and follow the step-by-step guide to rip and convert DVD on Mac OS Yosemite in a few clicks. Launch the program and insert the DVD disc that contains the DVD movies you want. Click the Load DVD button to choose the DVD files you want to convert. Note that you can also import DVD Folders, ISO files and IFO files. After loading the files, now you need to choose an output format. If you just want to play the DVD files on Mac with QuickTime or iTunes player, MOV or M4V is the recommended output format. If you want to convert DVD to play on iPhone, iPad or some other mobile devices, just specify the corresponding optimized presets as the output format, since these output parameters has been adjusted to fit seamlessly your devices. When all settings are done, now the only thing you need to do is click the Convert button to begin ripping DVD immediately. The conversion will finish in a few minutes. After the conversion is complete, you can enjoy the DVD movies as you like on Mac without any hassles.